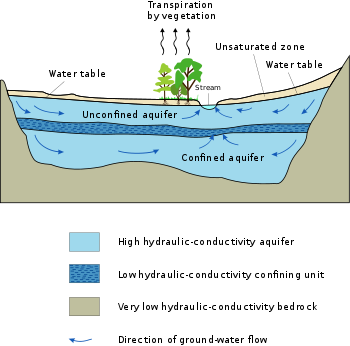 An aquifer is an unnergrund layer o watter-bearin permeable rock or unconsolidatit materials (gravel, saund, or silt) frae which grundwatter can be extractit uisin a watter well. The study o watter flow in aquifers an the characterization o aquifers is cried hydrogeology. Relatit terms include aquitard, which is a bed o law permeability alang an aquifer, an aquiclude (or aquifuge), which is a solid, impermeable aurie unnerlyin or owerlyin an aquifer. If the impermeable aurie owerlies the aquifer pressur could cause it tae acome a confined aquifer. ↑ "aquitard: Definition from". Answers.com. Archived frae the oreeginal on 29 September 2010. Retrieved 2010-09-06. This page wis last eeditit on 20 November 2013, at 21:02.